Wells sends Berry a check for $500 to use for whatever she thinks the Berry Schools are most in need of. Wells comments on the beauty and interest of the day she spent at the schools, then shares that her usual routine has been disrupted by her absence from home and by the "excitement over" the Vestris Shipwreck. Her brother was on board but "spared." Wells writes of the lovely visit to the schools she and her husband had, mentioning hearing the students sing old English ballads, the Foundation School, and the House of Dreams. 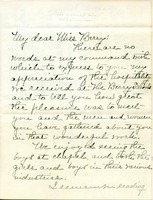 Wells has recently learned that her brother was on the SS Vestris, which wrecked on the way to Robinson Crusoe Island. Her brother survived the shipwreck and she was glad to have been spared the news until he was known to be safe.